This rare and interesting name is of Anglo-Saxon origin and is a locational surname from a place that is now "lost". An estimated seven to ten thousand villages and hamlets are known to have disappeared in the British Isles since the 11th Century, due to such causes as the enforced clearing of villages for sheep pastures during the 14th Century and natural disasters such as the Black Death of 1348. Whatever the reason, the place no longer exists on the maps, the name remains only in the form of a surname. Addenbrooke is thought to have been situated on the borders of Worcestershire and Staffordshire and means "the settlement of Adda's people by the stream", from the Olde English pre 7th Century personal name "Adda" with the suffix "ing", denoting "people of " and "broc", brooke or stream. 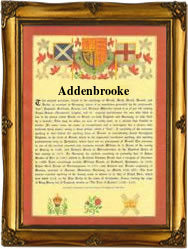 John Addenbrooke (1680 - 1719) was founder of the hospital at Cambridge and published an "Essay on Free Thinkers" in 1714. The first recorded spelling of the family name is shown to be that of William Addyngbrooke, married Elisabeth Grene, which was dated 25th April 1540, St. Margarets, Westminster, London, during the reign of King Henry VIII, Bluff King Hal, 1509 - 1547. Surnames became necessary when governments introduced personal taxation. In England this was known as Poll Tax. Throughout the centuries, surnames in every country have continued to "develop" often leading to astonishing variants of the original spelling.